AllegroGraph is a database and application framework for building Semantic Web applications. It can store data and meta-data as triples; query these triples through various query APIs like SPARQL (the standard W3C query language) and Prolog; and apply RDFS++ reasoning with its built-in reasoner. AllegroGraph includes support for Federation, Social Network Analysis, Geospatial capabilities and Temporal reasoning. All of these are described in more detail below. One thing to note is that AllegroGraph doesn't restrict the contents of its triples to pure RDF. In fact, we can represent any graph data-structure by treating its nodes as subjects and objects, its edges as predicates and creating a triple for every edge. The named-graph slot can be used to hold additional, application-specific, information. Used this way, AllegroGraph becomes a powerful graph-oriented database. In RDF-land, an assertion is a statement that subject predicate object (in the context of graph). All of s, p, o, and g are strings of arbitrary size. Of course, it would be very inefficient to store all of the duplicated strings directly so we associate a special number (called a Unique Part Identifier or UPI) with each unique string. The string dictionary manages these strings and UPIs and prevents duplication. To speed queries, AllegroGraph creates indices which contain the assertions plus additional information. AllegroGraph can also perform freetext searching in the assertions using its freetext indices. You should notice that although the above diagram shows a triple store through an RDF-lens, there is nothing that constrains AllegroGraph to the RDF world. In fact, AllegroGraph contains many features that are outside of pure RDF and make it a true graph database. In graph-database land, an assertion says that node s is connected to node o via edge p with additional data g.
AllegroGraph has the ability to encode values directly into its triples (thus bypassing the string dictionary completely). This allows for both more efficient data retrieval and extremely efficient range queries. We take advantage of this data representation in the add-on libraries for geospatial reasoning, temporal reasoning and social network analysis. AllegroGraph implements the ACID properties of transaction processing (atomicity, consistency, isolation, and durability) similarly to other database products. This section describes the details of how these properties are implemented and what guarantees developers can expect. The atomicity property defines that all updates within one transaction are persisted together. A transaction either completely fails or completely succeeds. With AllegroGraph, when an application calls rollback, the changes that it has made to the triple store since the last commit or rollback are discarded. Likewise, when an application calls commit, all changes since the last commit or rollback are persisted. No partial transaction results will ever be seen by other clients of the database. The consistency property defines that every transaction takes the database as a whole from one consistent state to another. The database itself will never be inconsistent, according to its own consistency rules. AllegroGraph does not allow for user-defined consistency rules (like, say, foreign key constraints in a relational database). That means that the database has no influence on the application-level consistency of the data stored in a triple store. It is up to the user to make sure that transactions create and maintain a consistent application-level state. At the same time, AllegroGraph guarantees that every commit operation will take the database from one consistent internal state to another consistent internal state. It is possible for two concurrent transactions to attempt contradictory changes to triple store metadata, such as mapping the same predicate to two different datatypes, or defining the same freetext index using different parameters. The first transaction to commit will succeed normally. Those changes become visible to the second transaction when it attempts to commit. (No rollback is necessary.) AllegroGraph will signal metadata errors at that point, preventing the second transaction from committing. The isolation property defines that every transaction only sees data of other completed transactions, and not partial results of transactions running concurrently. AllegroGraph implements the snapshot isolation model. In this model, every transaction sees a snapshot of the persistent database state as of the time when the transaction has been started by a commit or rollback operation. During the course of executing transaction code, other transactions can commit and change the persistent state without affecting the snapshot of this transaction. Once the transaction commits, any updates made by concurrent transactions will be made visible as part of the snapshot of the next transaction. As no triple locking is performed by AllegroGraph, it is possible that a triple that is being read in a transaction could be deleted in a concurrent transaction. Developers need to be aware of this and similar possibilities and make sure that transactions are properly sequenced if such concurrent updates could have an impact on application-level consistency. When the commit operation of AllegroGraph returns, the database server will have written the updates made by the transaction to the transaction log and waited for the log I/O operation to finish. Therefore, the application can be sure that every committed transaction will have a permanent effect on the persistent database state. You can manipulate data in triple stores via many different interfaces and languages including Java, HTTP and Lisp. Each language provides mechanisms to create and open triple stores; load them with data in bulk-mode or programmatically; enable RDFS++ reasoning (see RDFS++ Reasoning); query for triples that match simple or complex constraints; serialize triples in many formats; and understand and manage server performance. as well as in several non-RDF formats, listed here. Data loading is described in the Data Loading document. If your data is in a format that AllegroGraph does not support, please contact support@franz.com. In the meantime, you may be able to use the open source tool rapper to convert your data into a format that AllegroGraph can use. You can create freetext indices while loading triples by specifying which predicates should be indexed. Additionally, AllegroGraph supports a wide array of encoded data-types such as numbers, dates, and geospatial coordinates. Using these data-types not only shrinks the size of your triple store (because the string data need not be saved) but also allows super-fast range queries and geospatial queries. Of course, you can also load triples into AllegroGraph programmatically. This can be used to import custom data formats, or to build a triple store incrementally. Triples can be added using RDF syntax or AllegroGraph's special encoded data-types. Programmatically added triples can also make use of the AllegroGraph's triple-id to perform super-efficient reification. You can use these pattern-based queries in your own programs to query triple stores at the bare-metal. In fact, AllegroGraph's other query interfaces such as SPARQL, Prolog and the RDFS++ reasoner all ground out in patterns exactly like these. If you wanted to find all people whose weight was greater than 200, then you would need to scan every triple in the store, lookup the string, parse it and then do your comparison. Ouch! With AllegroGraph, the value is encoded directly in the raw triple data (using a special kind of UPI). A range query involves immediate data lookup and comparison and is therefore as fast as a search for an individual triple. When AllegroGraph is given a query pattern, it responds with a cursor that iterates over the triples that match the pattern. Programs can use functions like Lisp's cursor-next to move through a cursor or use higher-level constructs like map-cursor. Out of the box, AllegroGraph builds six index flavors in the background as triples are added. It is possible that duplicate triples will be stored. This can, for example, occur because two users independently create and commit identical triples. Duplicate triples reduce the efficiency of the system. To remove these duplicate triples, use the function delete-duplicate-triples. It lets you specify what duplicate means: Two triples can be the same if they have the same subject, predicate, object, and graph (the :spog option, which is the initial value); or they can be the same if they have the same subject, predicate, and object, ignoring the graph (the :spo option). SPARQL is the query language of choice for modern triple stores. AllegroGraph's SPARQL sub-system adheres to W3C standard; includes a query optimizer; and has full support for named-graphs. For more information on using SPARQL with AllegroGraph, see the tutorial and SPARQL reference guide. Description logic or OWL reasoners are good at handling (complex) ontologies, they are usually complete (give all the possible answers to a query) but have completely unpredictable execution times when the number of individuals increases beyond millions. The reasoner tutorial provides a quick introduction of how each predicate behaves and describes the reasoner in more detail. AllegroGraph also includes an optional OWL restriction reasoning module that supports owl:hasValue, owl:someValuesFrom and owl:allValuesFrom (see the hasValue reasoning tutorial). 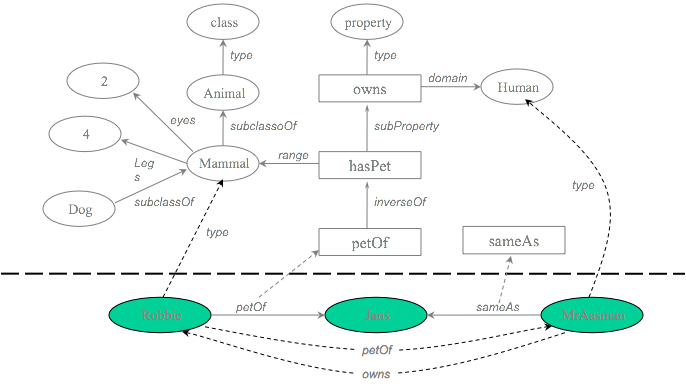 Prolog is an alternative query mechanism for AllegroGraph. With Prolog, you can specify queries declaratively. The Prolog tutorial provides an introduction to using Prolog and AllegroGraph together. Our Prolog is implemented in Lisp so for Lispers, the combination of Lisp, Prolog, and AllegroGraph are a natural triad. You can also send Prolog select queries to the server using Java (see Javadocs) or using the HTTP-interface (see the HTTP protocol). You send them as strings and you get the bindings back as lists of values. For the Lisp interface, besides the tutorial mentioned above, see the Lisp Reference. The block diagram we saw above is abstract; it can be implemented in many different ways. AllegroGraph uses that same programming API to connect to local triple stores (either on-disk or in-memory), remote triple stores and federated triple stores. A federated store collects multiple AllegroGraph triple stores of any kind (local, remote, reasoning, etc) into a single virtual store that can be manipulated as if it were a simple local store. Note that this federation of AllegroGraph stores is not related to the similarly named SPARQL federated queries where the use of the SERVICE keyword in a query can direct a portion of a query to a particular SPARQL endpoint which need not be an AllegroGraph store. it makes data archive almost trivial. Since federation provides a natural mechanism to join disparate triple stores, we can use separate instances of AllegroGraph to load data on multiple CPUs and then combine them at query time. 1 Loading triples is an extremely parallelizable task in that using N CPUs decreases the total time by a factor of N.
AllegroGraph's federation mechanism and flexible triple store architecture combine to make it easy to connect multiple stores (in the same AllegroGraph instance, multiple AllegroGraph instances on the same machine, or multiple AllegroGraph instances on a cluster of machines) together and treat them as one. When a user creates an AllegroGraph federated repository, a virtual index of the constituent stores is created and maintained in the client session to facilitate intelligent query processing and maximum performance. For example, we can combine the dbPedia, the USGS Geonames database and Census information into a single virtual store and explore the interconnections between these datasets without worrying about where the triples originate. Even better, we can keep different kinds of triples separate and combine them as needed. E.g., we can keep known facts, inferred triples, provenance information, ontologies, metadata and deleted triples in separate, easily manageable stores and combine and re-combine the data as necessary. Enterprise data volumes are growing without bound making it essential to enable the accumulation and archiving of multi-billions of triples. Federation lets you segment your data into usable chunks that can be swapped in and out as needed. The figure illustrates how an enterprise data center can use federation to easily work with the three most current months of data. Since federated data stores can be built easily and easily changed, it is just as simple to look at historical data whenever that is necessary. AllegroGraph supports several specialized datatypes for efficient storage, manipulation, and search of Social Network, Geospatial and Temporal information. AllegroGraph also supports the xsd:date, xsd:dateTime types, and the xsd:integer and xsd:decimal types. 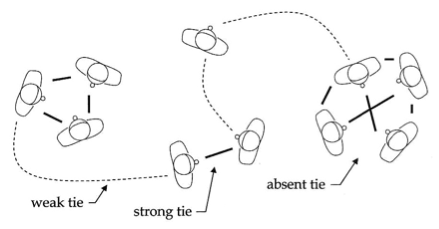 How closely connected are any two individuals? What are the core groups or clusters within the data? The field is full of rich mathematical techniques and powerful algorithms. AllegroGraph's SNA toolkit includes an array of search methods, tools for measuring centrality and importance, and the building blocks for creating more specialized measures. AllegroGraph provides a novel mechanism for efficient storage and retrieval of multi-dimensional data, location data in particular. We often refer to this kind of data as "geospatial", although that term refers specifically to positions on or around the earth's surface. AllegroGraph supports a more general notion of N-dimensional ordinates systems. Coordinates are packed into a single UPI (defined above). The more coordinates, the less precision for each coordinate, of course, because the total number of data bits is fixed. The user can control the allocation of precision among the several ordinates. See the document N-dimensional Geospatial for a description and a tutorial on the new nD geospatial facility. datetimes in ISO8601 format: "2008-02-01T00:00:00-08:00"
AllegroGraph uses a set of sorted indices to quickly identify a contiguous block of triples that are likely to match a specific query pattern. S stands for the subject URI. P stands for the predicate URI. O stands for the object URI or literal. G stands for the graph URI. I stands for the triple identifier (its unique id number within the triple store). The standard seven indices are enabled when you create a triple store. You can customize this set, however, both by eliminating indices that your application will not use, and by requesting custom indices that match your more unusual triple patterns. For instance, if your application does not use subgraphs, the indices beginning with "g" will never be used. You can speed up indexing dramatically by eliminating these indices from the system. AllegroGraph indexing is fully discussed in Triple Indices. Of course, freetext indexing slows the rate at which you can insert triples. Our experiments suggest that you'll see a decrease somewhere between 5 and 25% depending on the number of predicates involved and the kinds of string data in your application. See Freetext Indices for more information. AllegroGraph Replication is a real-time transactionally consistent data replication and data synchronization solution (replication is making new copies and synchronization ensures existing copies are updated to be identical). It allows businesses to move and synchronize their semantic data across the enterprise. This facilitates real-time reporting, load balancing, disaster recovery, and high availability configurations. It assists organizations in mission critical challenges, such as managing liability or fraud, eliminating the risk of distributed enterprise scale environments, and reducing the costs. AllegroGraph replication is documented in Replication. AllegroGraph comes in multiple flavors and works with multiple programming languages and environments. The Java client interface implements most of the RDF4J and Jena interfaces for accessing remote RDF repositories. Because AllegroGraph provides functionality not found in other triple stores, we have implemented extensions where applicable. See the pre-release Jena page for information on our Jena support. (See the tutorial and Javadocs for more information). Note that Java 8 (or later) is required for the java client. The Python API offers convenient and efficient access to an AllegroGraph server from a Python-based application. This API provides methods for creating, querying and maintaining RDF data. The Python tutorial provides an overview of the API. It is now possible for web developers and programmers alike to interact with AllegroGraph 6.5.0 completely using a RESTful HTTP protocol (using GET, PUT, POST) to add and delete triples, to query for individual triples and to do SPARQL and Prolog selects using the Sesame 2.0 HTTP-interface with some extensions. See REST/HTTP interface and HTTP reference for more information. Lisp programmers can open and use triple stores from within Lisp. Lispers can create applications in the same image that the AllegroGraph server is running or use a remote triple store to access data in client/server mode. See Lisp Quickstart and Lisp Reference for more information. Cloudera provides Apache Hadoop tools. AllegroGraph supports loading files from Hadoop Distributed File Systems,such as supplied by Cloudera. MongoDB is a cross-platform document-oriented NoSQL database. See MongoDB integration for information on AllegroGraph's integration with MongoDB. Apache Solr is an open-source freetext indexing/searching platform from the Apache Lucene project. 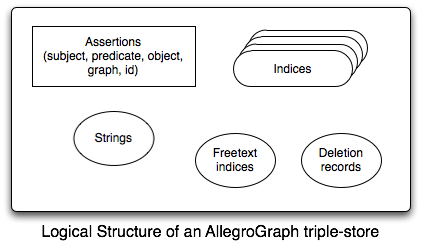 Lucene is a Java Based Freetext Indexer with many features. Solr is an XML database wrapper around Lucene. See Solr text Indices. Top-Braid Composer (TBC), a product of TopQuadrant, Inc., is a graphical development environment for modeling data, connecting data sources, and designing queries, rules and semantic data processing chains. See TopBraid Composer Plugin. Anaconda® is a data science platform consisting of a package manager, an environment manager, a Python distribution, and a collection of open source packages. See AllegroGraph and Anaconda for information on AllegroGraph's integration with Anaconda. The AllegroGraph website is allegrograph.com. AllegroGraph is a product of Franz Inc..
where <version> is vX.Y[.Z], 6.5.0 for the current version. There is a search tool in the upper left corner of each documentation page. That tool uses Google to search for the desired phrase in the documentation on the Franz Inc. website noted just above. 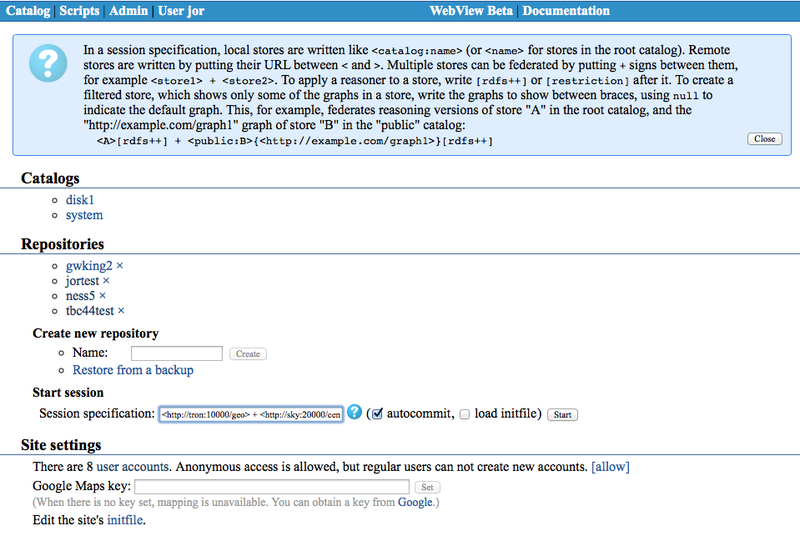 That means that even if you have a local copy of the documentation, the search is done on the web copy. http://franz.com/agraph/support/documentation/current/ always links to the documentation for the latest release.